Ride with less complications and potential mechanicals (without a front derailleur). 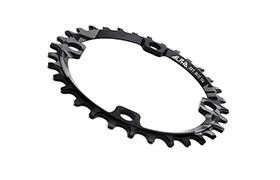 Everything is centred around the specific shape of the narrow wide teeth that can channel the chain better. 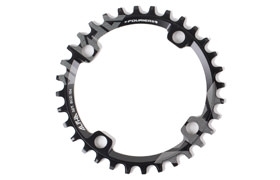 This way, it is always aligned right with the chainring and there's less need for a chain guide. 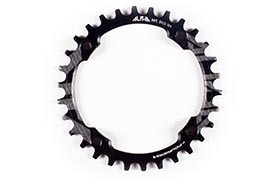 The narrow wide RIDE ALPHA ring is Aluminium 7075 T6 full CNC, the best alloy for this type of product. Its specific design ensures lightweight strength. 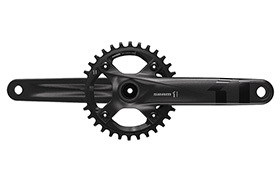 Standard 104 BCD is the most widely used and fits the most cranks on the market. The ring is also available in 30T and 32T. Black anodised finish for durability with a laser logo.